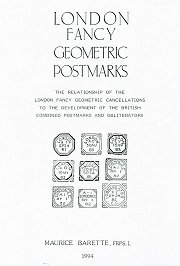 The London Postal History Group was founded in 1971 by Peter Forrestier-Smith, who edited their magazine the London Postal History Group Notebook until ill health forced his retirement in 2009. However, sufficient funds remained in the Group treasury to allow an archive of its publications to be scanned by John Parmenter and Anthony Shine and made available on a USB stick. John has kindly offered to let the GBPS archive the files on the stick on this site. In addition to the Notebook the collection also includes the range of books and other publications totalling some 2,000 pages produced by or associated with the Group, including works on Late Fee mail, numeral cancellations, Krag machines, an 1850 Postal Directory, and working records from the London EC district over a period of years. John has also kindly included his detailed listings of Post Office numbers, which have been placed under the relevant section of this site. To obtain a copy of the USB stick - price £5 post free - please contact John at .